Written 15th November 2007; images added 26th November 2007; 1841 census of Foss added 28th November. The following extracts should prove of great interest for anyone interested in the legend of Ulrich Kennedy and the forming of the Perthshire Kennedys. I first came across a version of this story in 'Old Highland Days' by the Rev. John Kennedy DD. 'According to our family traditions, an Earl of Cassillis married his sister to the chief of Lochaber and sent with her a dozen of her kinsmen, partly as bodyguard to her ladyship and partly to instruct the wild highlandmen of Lochaber in the ways of civilization. It seems however that the newcomers were quicker to learn than to teach. Great is the assimilating power of majorities; and the Kennedys instead of reforming the wild highlandmen of Lochaber became as wild as any of them. One of the favourite occupations of the highlanders it need hardly be said was cattle raiding. In the reign of James VI either before he succeeded Elizabeth on the English throne or not long after, my ggggg-gf Urich Mac Urich Kennedy set out from Lochaber at the head of one of these raiding gangs. (the traditional sword of Urich is still treasured by my kinsman Mr. James Kennedy at Killiechassie who is the chief authority for these earlier details). Intrigued by this account, with its new spin on the reasons for the Kennedys first going to Lochaber, I carried out more research and eventually came across the following. I believe this is the story that Donald Whyte picked up and referred to in his Kennedy account in 'Surnames of Scotland'. by James Kennedy who with his cousin 'J.J'. is 'ultimus nominis jacobi haeres'. I propose to set forth in these notes all that I have been able to ascertain regarding our ancestors in the 17th and 18th centuries. My conclusions are based on an analysis of the marriage and baptism registers of the parish of Dull, corroborated and supplemented by family and local tradition. The general facts regarding the state of the country are taken, for the most part, from General Stewart's work on the Highlands. We belong to that branch of the Perthshire Kennedys which lived in Foss; and we came originally from Lochaber. I first heard the story of our eponymous ancestor Urich from James Kennedy the 'mason' of Killiechassie, and I give it as nearly possible in his own words. Ever since then, said my informant, all the great Kennedys have had 7 sons just as Urich and my father had. I cannot tell you, he continued, what became of the 7 sons of Urich; but the eldest son was Robert. He settled in Tulipure of Strath Tay. Milton of Tulipure was his farm and the 'big' Kennedys are his descendants. Alexander was the 2nd son. He had Kirkton of Foss, and was the father of the 'little Kennedys'. Another son came to live with Robert the eldest; and he had Tullimet. The youngest stayed with his father in Dull and from him the Kennedys of Kinloch Rannoch are descended. The other sons settled somewhere on the road to Pruff [sic � probably Crieff?] but exactly where I cannot tell. They are the ancestors of the other Perthshire Kennedys. Looking west towards Appin of Dull, with Weem hill and Dull wood on the right. Dull parish church is out of sight at the foot of Dull wood. I [the author continues] accept this story as historical in the main. It agrees exactly with the distribution of the Kennedys in the commencement of the 18th century as disclosed by the parish registers. The Kennedys of Lochaber received my grandfather with memorable kindness on his itinerating tours regarding him as a long lost relative; and far on into the 18th century the cattle lifters from Lochaber regularly took the route by Loch Rannoch when raiding the lowlands. Moreover, the incidental notices in books of the Perthshire Kennedys [??] represent them as a wild and broken clan; they must have fled from their original seats and they could only have come from Ayrshire, Dingwall or Lochaber. 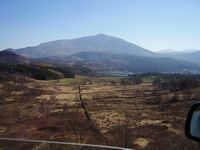 There is nothing to connect them with Ayrshire or Dingwall while Lochaber is within easy reach. I cannot say whether the 'bonnie lasie's eyen ' were as sweet as Urich thought them but I think it is certain that we came from Lochaber; and I am not disposed to doubt that cattle lifting and love tempted Urich from afar. I cannot however admit with James the 'mason' that it all happened 'exactly 375 years ago' . The figures are too round and chronology is the weak point of tradition. At the commencement of the 18th century there were not more than 5 or 6 families of Kennedys in the land of Foss; and this would not represent more than two generations from the original founder Alexander. In Strath Tay the Kennedys were spread, exactly as the legend represents them, from Cluny to some undetermined point in Loggierait [sic]. Being descended from 2 brothers, they were not numerous than the Kennedys in Foss; how numerous I cannot say in the absence of the Loggierait registers. But I doubt if they numbered a dozen families. If so, we would have the same result. I therefore date Alexander approximately about 1630 and Urich about 1600 AD. Urich, or Uric, has a Norse sound; but I fancy it is the Gaelic equivalent of the Irish Hurrish [?]. As to the name Kennedy, the Rev. Mr MacLean of Piteally tells me that it is very old. In its present form its nearest Gaelic equivalent would be 'Kanadach' the head of the confessors (of the Faith). but he was inclined to connect it with Kainach, or Kenneth. The Kennedys then, like Mackenzies, would be followers of S. Kenneth, the companion of S. Columba. This of course would explain the connection between the Scotch and Irish Kennedys. The Kennedys of Strath Tay are locally known as the 'big' Kennedys and those of Foss as the 'little' Kennedys. Whether this was on account of their stature or because the Strath Tay Kennedys were descended from the oldest son, I cannot say. At any rate Alexander, the 2nd son, the founder of the 'little' Kennedys, with whom alone I am concerned, selected a lovely spot to dwell in, near the top of the col which separates Schichallion [sic] from Farragon. There lies a treeless tarn called Kinardochy; a well sized burn hurries from its northern bank through rock and heather, and lower down through woods of birth and oak to the swiftly flowing Tummel. 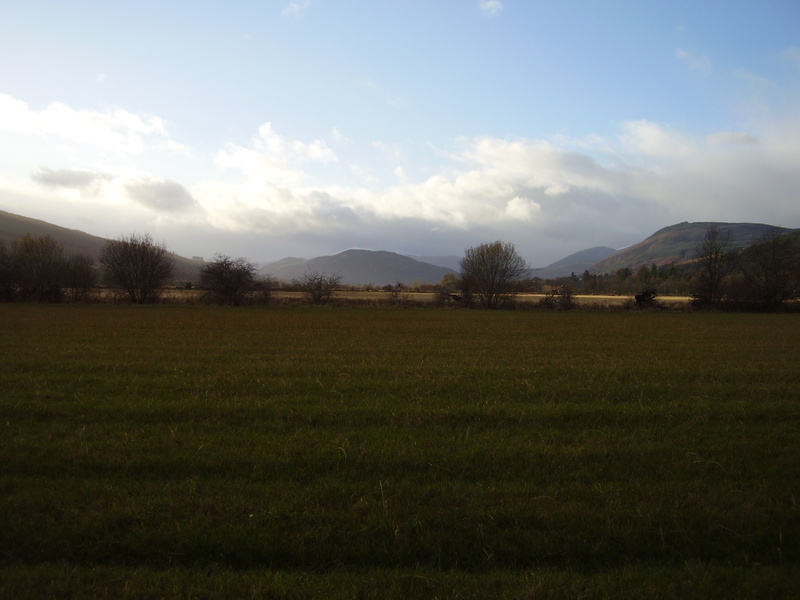 The mountain slopes from the burn to the head of Loch Tummel are know as the 'land of Foss'; and Foss House, once a castle, stands in the wood near the confluence of the burn and the river. On the other, or western side, the moors stretch upwards to the outlying shoulder of Shichallion called Kynachan. In the first half of the 18th century these Braes of Foss and Kynachan were studded with small farms containing 15 or 20 acres of arable, with pasture for a horse, four or five cows and perhaps twenty sheep. Some of these farms can still be identified but the majority have disappeared. The Laird of Foss was a Stewart, so were most of the farmers. 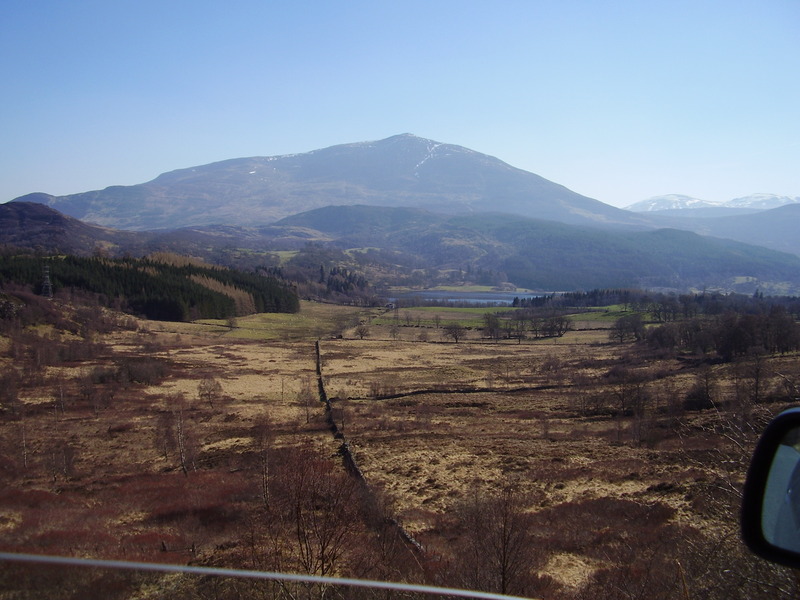 The Stewart country embraced Strath Tummel and the lower part of Strath Tay; the Robertsons who are a sept of the Stewarts mustered around Loch Rannoch. These Stewarts were the clansmen their lairds the feudal lieges of the Duke of Athole. They boasted of their descent from the Wolf of Badenoch who had built Garth castle and through him the royal line of Stewart. They were Jacobites to the backbone, conspicuous in 1693 and 1745 and hereditary enemies of the Campbells and Argyle. According to Lord President Forbes they were the strongest body of men and the readiest to rise of any in the central Highlands. A few had remained Romanists but the majority were Episcopalians. Amongst these Stewarts of Foss Alexander Kennedy had settled about 1630 and founded the race of the little Kennedys. In the first quarter of the 18th century they counted 5 or 6 families all settled on farms in Foss and Kynachan. By the middle of the century they numbered about 50 souls and a couple of families probably reduced to the condition of day labourers, had removed to the far [E?] end of Loch Tummel. These Kennedys were really clients of the Stewarts and doubtless like them Jacobites and Episcopalians. Our direct ancestor among these Kennedys at the commencement of the 18th century appears to have been a certain Duncan. He lived in Dunean of Foss, a farm long held by Kennedy and married to Janet Stewart and probably had several children. [this ends my extract from 'Kennedys of Foss']. Here I will leave the story of this family as it is of less general interest than the main foundation legend I am trying to convey. How much of the early part of the story is historical fact I will leave to people to form their own opinion. There is no record of a marriage between a daughter of the Earl of Cassillis and Lochiel; but then there is no record of Ulrich murdering someone and being put to the horn either, which is the more usual version of why he went to Lochaber. If, indeed, he existed at all. It is a pity that the author seems to have been unable to locate the Logierait parish register, since this is easily available now. According to my research it contains the largest concentration of Kennedy parish baptisms in the whole of Scotland (more even than Maybole in Ayrshire) - with Dull a close second! I have not yet attempted to cross check my analysis of the Kennedy families with those of the above account but hope to do this at some stage. For marriage/banns the two parishes swap places, with Dull parish (1703-1855) coming out top with a staggering 277 Kennedy marriages. James Robertson has done some excellent research into the Kynachan estate in particular. The records he has extracted show many references to Kennedys living on Stewart lands in Foss, and in particular a John Kennedy who was tacksman at Milne of Kynachan in the 1750s. This document is especially rich in information but bear in mind that spelling was very idiosyncratic in those days so not all placenames and surnames have the same spelling (it is not sufficient to look for 'Kennedy'!). Study is best done with a combination of old and modern maps; for the former the online maps at NLS are best, especially the one-inch Ordnance Survey maps. The modern map of Foss does not show Daloist but it can be seen on the nineteenth century Blair Atholl map (sheet 55), adjacent to Kinardochy.